Vacation Apartments at 300 m from the small tourist port of Scarlino and 500 m from the beaches of fine sand. The position where there is the resort is ideal for visiting the most beautiful beaches of Tuscany, Follonica 5km with fine sand and shallow water; Cala Violina 7km, a small sandy beach surrounded by the wilderness of the Maremma, Punta Ala, an exclusive resort Maritime Italian, world famous for the boat Luna Rossa, Castiglione della Pescaia at 15km, 25 km of the Gulf of Baratti, the natural oasis of the WWF in the vicinity of Monte Argentario at 50km. 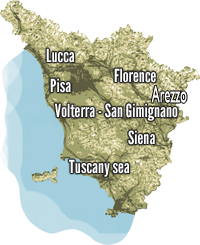 The strategic location of the apartments makes it an excellent starting point to visit Volterra, Siena, Massa Marittima, Grosseto and Rome (about 2 hours by car). The complex has 27 apartments of various types and sizes can accommodate from 2 to 7 people. Each apartment has a small patio or terrace. Guests may make use of the pool and bar located on the property. Also nearby are golf courses, riding schools, tennis schools, boat hire, windsurfing schools and the natural park dell’Uccellina. Food, bars and restaurants and banks at about 500m from the apartments. SC1067 Mono with Balcony(2 people+1) 31mq first floor : double bed, bathroom with shower, living room with kitchen and sofa bed. IlPrice include: bed linen, kitchen linen, gas for kitchen, electricity, water, swimming pool(apening mid may – mid september) Air/co.